Take Your Business to the Next Level | Free Ideas for Business Growth. Only entrepreneurs have the freedom to do what their hearts and heads tell them, unfettered by rules and regulations and set ways of doing things. 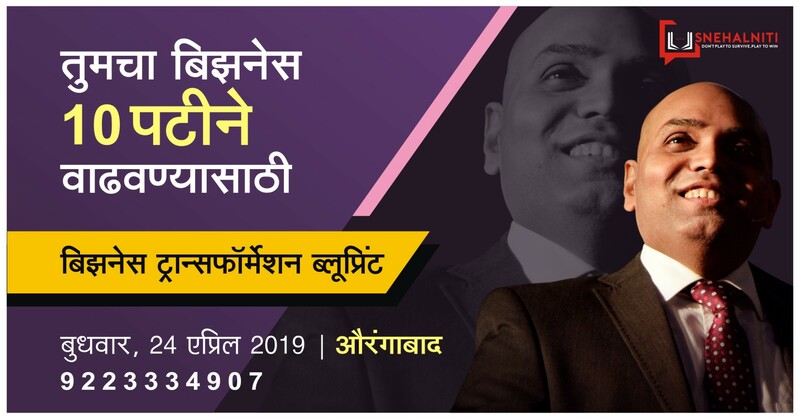 SnehalNiti, led by Maharashtra's best business coach Snehal Kamble, provides practical thinking tools, business training and a growth-oriented community to keep entrepreneurs in the right mindset to make their most valuable and unique contributions, achieve their biggest goals, grow their businesses and enjoy an unparalleled quality of life. तुम्ही बिझनेस ट्रान्सफॉर्मेशन ब्लूप्रिंट का शिकली पाहिजे ? स्नेहलनीती मार्फत नव्या दमाच्या युवकांना उद्योजक बनण्याचे प्रोत्साहन केले जाते. मराठी मोटिव्हेशनल स्पीकर, बिझनेस कोच, मराठी उद्योजक आणि लेखक स्नेहल कांबळे हे याद्वारे तरुणांना मार्गदर्शन करण्याचे काम करतात. स्नेहल यांनी आतापर्यंत तीन लाखांहून अधिक उद्योजकांना प्रेरणा दिली आहे. आणि हा आकडा दिवसेंदिवस वाढतच चालला आहे. Get the latest blog updates and event details mailed to your inbox..